"These aren't your mother's zombies!" 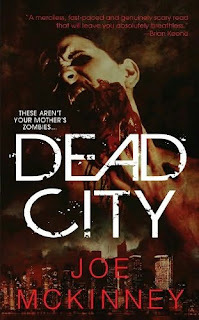 cries the tagline on the front of Joe McKinney's 'Dead City.' Which leads me to believe that reading the book is not actually a part of a tagwriter's job description. To me, 'these aren't your mother's zombies' is a way of saying, 'check it, these zombies are new and different and unlike the zombies of your mother's day.' 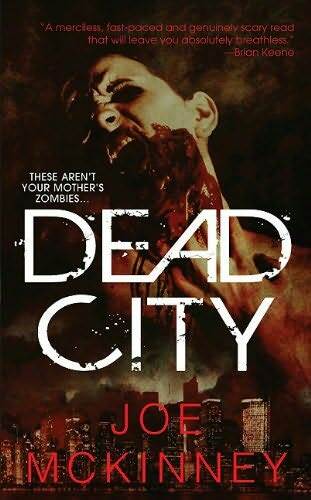 Except that I can't remember the last time I encountered a zombie story as old school as 'Dead City.' These are your mother's zombies. Your mum went to high school with these zombies, and when she sees them in the supermarket she stops to catch up for, like, hours. But it's not a bad thing! In fact, the "tradionalness," if you will, of Dead City was probably my favourite aspect of the book. It seems that as zombies have grown increasingly fashionable authors have been trying to put a new spin on them. It's like zombies alone aren't enough any more, it has to be steampunk zombies (Boneshaker), or blogger zombies (Alison Hewitt is Trapped) or thinking zombies (Warm Bodies) which is fine and good, but you know, sometimes you just want to read about zombies. And on that, McKinney delivers. The book is set in San Antonio and follows policeman Eddie through the first night of a sweeping zombie invasion. He wants to get back to his wife and kid, and there are a bazillion zombies to get past first. What can I say about this book? If you like zombies, you'll enjoy it. If you're sick of zombies, you probably won't. McKinney's skill lies in writing tense and effective action scenes. He doesn't fall into the repetitive traps of some zombie novels, instead he thrusts Eddie into a number of different situations that keep things interesting and exciting. McKinney is also very, very skilled at scene setting. He has that rare ability to paint a detailed mind picture in your head with just a single sentence. I can't remember the last time I encountered such vivid scenes in any book. McKinney has a knack for capturing quiet moments amidst all the zombie carnage, I really can't praise his descriptive skill highly enough. He's less skillful when it comes to dialogue. Nothing the character's said ever rang entirely true, and he had a habit of using characters as an excuse to launch into hamfisted philosophising. (Are zombies people too? Did mankind bring them on themselves? Blah, blah, get to the brains!) There were also some inconsistencies in his plotting. Some things just seemed too convenient or easy, there were a few ideas that just didn't go anywhere, and the ending was way sudden. Really, the ending didn't seem like the end of a book so much as it did the end of a really long prologue. Which normally I would hate like nothing else (it's the reason I never read beyond Charlie Higson's 'The Enemy...'), but by the end of Dead City I found myself more intrigued than annoyed and I can easily see myself picking up the next book in the series. McKinney may not has written a book that offers a new twist on zombies, but that's exactly what I liked so much about it. And I'm sure I'm not the only one.